Star Trek IV: The Voyage Home (1986) Dir. Leonard Nimoy | Cappa Toons! 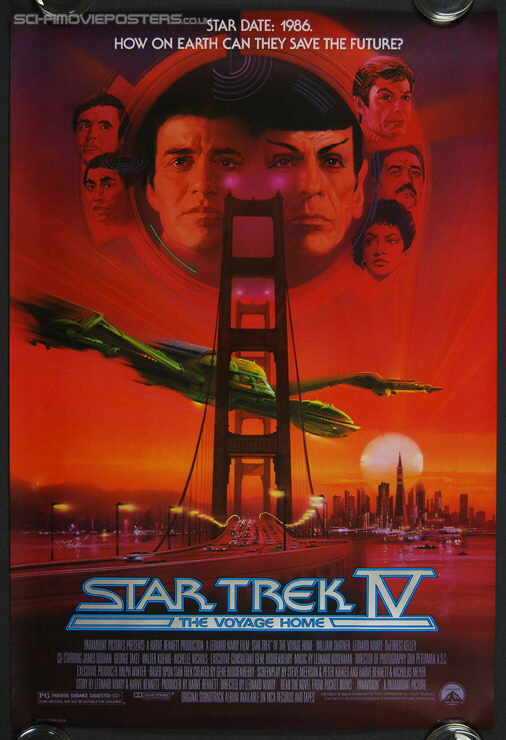 Arguably The Voyage Home (next to Wrath of Khan) is probably the most popular Star Trek film. I know Trekkie purists don’t care for it, mainly because its considered a silly premise to plop the Enterprise crew in modern times to create a fish out of water story. There’s also the argument that this is the one Star Trek film where the characters don’t actually travel anywhere apart from time travel. Thankfully however, I don’t consider myself a purist Trekkie. I enjoy watching reruns of the show all the time, but I can’t remember specific plots to episodes or movies. As far as just good movies go, Star Trek IV is a good one. It’s entertaining and it’s fun. I have few disagreements with it. This film also has some good character work in it as well, giving some of the other supporting players, Sulu, Uhura, and Chekov more to do than normal. I also like that Spock isn’t quite all there in his head after the experience of coming back from the dead. He’s a little off, doing a few crazy things, such as diving into the tank to mind meld with the whales. He has a bit of trouble adjusting to his surroundings, making him all the more fun to watch. As for the newcomer, Gillian (Cathrine Hicks), she’s fine in the movie, although it seems too easy that she just up and leaves her life, simply claiming she has no one who would miss her. I seriously doubt that. It’s too easy an excuse for her to just drop everything and leave. We know she loves the whales, but if she loves them THAT much it’s no wonder she doesn’t have any friends, only her career. I also think it’s weird that she would just decide to give a lift to two strangers after one of them just jumped into a whale tank without a believable reason. The other thing about this movie I also never understood was the forced conflict by having Gillian arrive the next morning to discover the whales have been transported without her knowledge. If she’s that much of a weirdo and a loner, no wonder they would want to trick her about the time the whales were leaving. Considering she’s in charge of their care, it doesn’t really add up. I have never liked it when conflict is forced instead of coming up for a good explanation as to why it exists. It’s just not terribly good storytelling, and the filmmakers are hoping the audience will be caught up in the movie enough not to really notice. It’s meant just to find an excuse to keep the story going. Also, when she gets to the future, she’s assigned to a science vessel. Why? I thought she came so she could watch over the whales. Whose else is going to have the expertise to study them? 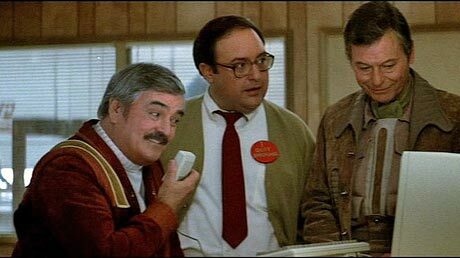 Overall, Star Trek IV: The Voyage Home is an enjoyable outing. There isn’t that much here in the way of great science fiction, and the film seems to hit us with a hammer a little bit about the extermination of Humpback whales. This film also completes the Khan trilogy, as Kirk and crew are united with a new Enterprise, and Kirk himself is demoted to Captain. But really it doesn’t matter if you haven’t seen the other films to appreciate this movie. Apart from the beginning and the Klingon ship, it can be pretty much watched as a stand alone feature. The story is not as engaging as Khan, but it’s a well though out story. We can also thank Nicholas Meyer for returning to co-write the film, who has some experience with time-travel fish out of water stories (see Time After Time, starring Malcolm McDowell). It’s nice to have a Star Trek film that everyone can enjoy.